I loved Johnny T.L. Jones, Jr. I loved the man. I loved his since of humor, which reminded me so much of my own grandfather. His sly smile was the only give-away to some of his best, dry, sarcastic, yet hilarious one-liners. Even Johnny couldn’t help but laugh and grin at some of his own best work. And, with good reason. He was a master at punch lines, and lines full of punch. He could carry the conversation with every person hanging on every word. And, he could finish every story with an exclamation and a point. Nearly every one of his stories made you laugh. Most of them, though, had a deep vein of sincerity and seriousness, at the same time. I’ll never forget the time that I stood in front of the Kentucky Racing Commission, fighting like heck to win the approval to put an Off-Tracking Wagering hub in the City of Prestonsburg. I was debating former Governor Jullian Carroll, who, at the time, was representing the interests of Terrell Ross and Murray Sinclair, who were bidding to put Thunder Ridge Race Track in the same jurisdiction. Only one of us could win. I should have known right then and there that I was not going to win that one. My friend was giving me the heads up to wrap it up. So, I did. Masterful. Timely. Funny. Serious. All in one. Then, there was the time that Johnny invited me out to his farm, Walmac International, off of Paris Pike in Lexington, KY. He was hosting his regular poker game, in the room above his parking garage. And, he wanted to see if I could make up the final hand at his table. Delighted and honored that he asked, I wanted to say “Heck Yes,” immediately, but I knew from the stories that I had been told that the pots could quickly exceed my modest means and budget. So, I told the master host that I would love to, but I had to decline. Johnny looked at me, with all seriousness, and said, “Geno, I’ll tell you what I’ll do. I’ll cover 3/4ths of your losses, but you will agree to cut me in on half of your winnings?” I thought for about half a second, and jumped at the offer. That Thursday night, I drove over to Walmac and climbed the steps to the card game room. There were two tables of games going on. Each chair filled with some of the best horsemen in the world. At one table was David “Fatty” Greathouse, and Warner Jones, the late, great Chairman of the Board at Churchill Downs. At another table was Johnny and Bruce Hundley. The chair between Johnny and Bruce was open, so I slid over and took it. About halfway through the night, I was doing OK. More than just holding my own. Cards were better than I could screw up. Chips piled up faster and deeper than I ever imagined possible. They got so high a show dog couldn’t even jump over them. Then, out of the blue, I heard a huge thud on the floor beneath my feet and under the table. I had no choice but to look down and discover what was causing the ruckus. There, lying on my boot, was an antique pistol. I looked up and saw Johnny smiling. Before I could answer, Johnny pointed that 6-shooter to the sky and fired off three rounds. Right through the ceiling of his garage and into the dark of the night. His beautiful bride came running into the room. Johnny was in stitches, as the rain dripped through the new spouts in the roof. The rest of the room forgot about pocket Aces, and laughed like a Joker. And, I ran to the restroom, as the pee dripped down my pants leg. He figured out that my winning was costing him more than my losing. And, he had to put a halt to that. That was Johnny T.L. Jones, Jr.. I loved the man. I loved his ability to step into any fray that he thought was worth fighting, like a silver-starred Sheriff in the days of Western lore and go toe-to-toe with the fastest, most daring, and gifted gunslinger. Didn’t matter the reputation that proceeded the arrogant, and combative foe. Johnny was never afraid to match wits, or guile, or nerve. Never afraid to stand up for what he thought was right. Back in the late 1980s and the early 1990s, I got the job as the Executive Vice President of the Kentucky Thoroughbred Association and the Kentucky Thoroughbred Owners & Breeders’ Association. Don’t ask me why or how. Just be assured, I did. At the same time, Churchill Downs was under the leadership — if you wish to utilize that word — of one Thomas Meeker. I will try to be as kind as I can be in this quick description of Meeker — who was the President of Churchill at the same time: He was mean as a rattlesnake and couldn’t tell the difference between a Thoroughbred and a jackass — although he resembled the latter much more than he did the former. Still, about every so often, we had to negotiate a “horseman’s contract” between the owners and trainers with the racetrack. To be honest, it was worse than mucking a stall with a table fork. Especially when you had Meeker on one side, and the late Don Ball — a man who just loved to irritate Meeker as much as he loved to negotiate down to the last teardrop penny — on the other. Inevitably, no matter how long and how faithfully each side negotiated and finally agreed, Meeker and Ball would find a way to blow a hole in the deal. Each. And. Every. Time. It got so bad one time that Meeker tried to throw a chair through a plate glass window into the conference room. The chair bounced back and knocked Meeker to the floor. Ball laughed. Didn’t help. So, with the Kentucky Derby rapidly approaching and no deal in sight, I called my good friend Johnny. He happened to be in Puerto Rico with his good friend Warner. A group of them had gone South for the winter to enjoy a little sunshine and R&R. I interrupted the latter. And, I asked Johnny to intercede with the Chairman of Churchill Downs. We all needed some intervention. Two days after my desperation call, I got a response from Johnny. He told me that “the matter” had been fixed. That Meeker had been told to agree to the deal. That the contract would be drawn up and ready for signature. The next day, at the established time and location, Ball and Meeker managed to turn a detente into a match that Frazier-Forman-Ali-Spinks would have been proud to call their own. And, of course, the paperwork was rendered useless. That’s how we used to shred documents back in the ’80s. Just get those two personalities together. So, that night, I called Johnny back. After a long delay of silence, I finally heard a sigh. A spit of juice from what had to be something lodged between cheek and gum. And, a grunt. “Ok. Give me a day.” The buzz of the phone hanging up still rings in my ear. Two days after my second desperation call, I got a response from Johnny. He told me that “the matter” had been fixed. That Meeker had been told to agree to the deal. That the contract was drawn and already signed. And, to expect the contract to be delivered by UPS the next day. I never saw or heard a one-armed banjo player. But I got the message. It couldn’t have been very good. I loved that he would cherish our little, impromptu get-togethers at Bruce Hundley’s farm kitchen with Kentucky Speaker Greg Stumbo and Majority Whip Joe Barrows. He would sit and tell stories and hold court. Everyone listened, laughed, and enjoyed. I loved that he would invite Bill Shoemaker and George Strait to his farm, and make sure both of them talked to me. I loved that he would get an extra ticket to the Alan Jackson concert down at Rupp Arena, and make sure that I had a seat. I loved that man. Loved him. When I heard the news of his passing in his home state of Texas this weekend, I must admit, I shed a tear. Maybe several. And, I felt an emptiness inside. More than a 10-gallon hat could hold, to be honest. I felt sad, because today we desperately need more Johnny T.L. Joneses in the world. Not less. When he is laid to rest on Tuesday — tomorrow — I feel certain that I will shed some more tears and fond memories. But before I finish, I need to reveal one more story that I think tells more about the man than any of the rest. I promise, I will make it short. Years ago, I had a mare that was OK at the racetrack, and both Johnny and I agreed that she could be an OK mare. One day, Johnny asked me who I was thinking about breeding the mare to, and I told him that I didn’t know. So, he asked if I would consider breeding her to Miswaki, a brilliant sire that Johnny stood at Walmac and a son of Mr. Prospector. And, as Johnny knew, a sire that I always admired. Greatly. I jumped at the offer. And, out of my skin, probably. A couple of years later, Johnny and I entered a smallish Miswaki filly in the Keeneland September Sale. On sale day, Johnny told me to go to the front of the pavilion and keep an eye on the bidding, and that he would stay in the back of the pavilion and watch from there. He told me that if I wanted to buy him out, to go ahead and bid. 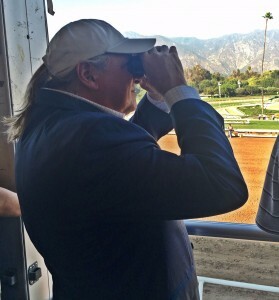 When the bidding went beyond my means, I simply watched the filly sell. The hammer fell and it was rung up to someone in “the back.” And, I quickly retreated to find my business partner and friend and find out who had bought the filly. And, he handed me the pink sales slip. And, he walked off. Not another word. I named that filly “Dark Haired Girl.” She went on to win a few races, but never became something special. The man who gave her to me, though? He was truly something special. A special friend. A special man. A masterpiece worth treasuring. A special man. Go rest high on that mountain, my good friend. I love you, and will miss you greatly.